Infuse is a medication infusion and bolus calculator built for healthcare providers. 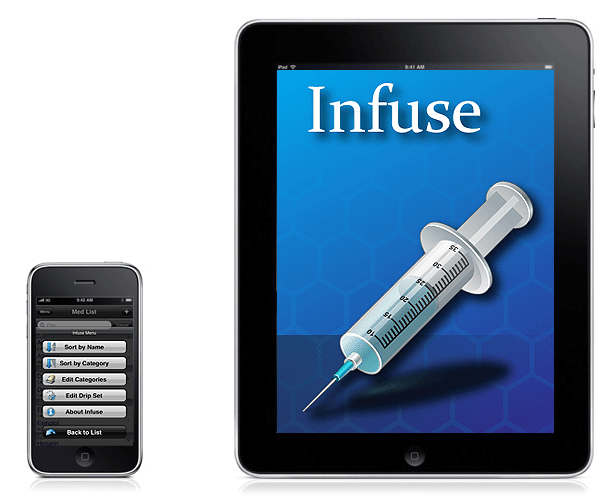 Infuse provides you all the tools you need to quickly calculate drug dosing whether by infusion or bolus. Medications are able to be added, edited and removed and even remain editable once selected so that the specific concentration or dose/rate can be adjusted. Bolus section adds items such as route, frequency and duration of administration. Notes may be added to each drug with a separate area for infusion notes and bolus notes. Editable categories allow you to sort drugs the way you want to see them, or simply let Infuse give you a fully searchable alphabetized listing. 15 common drugs are included to get you started. We have tried to use the iPhone/iPad interface to your advantage with items like slider bars that allow quick changes of drug dosing. Also, for those that prefer their trusty medication grid, we have you covered as well.